There are two quite opposite views about rural non-farm informal enterprises (RNFIEs). First, it is low productivity sector producing low-quality goods, and the second one recognizes it as dynamic, flexible, innovative and contributing significantly in economic development. 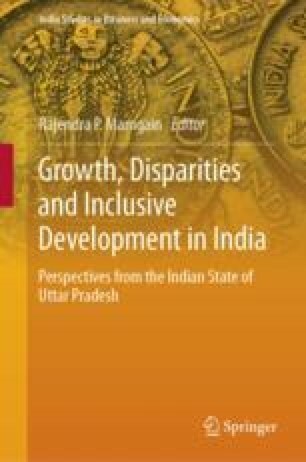 Based on National Sample Survey unit-level data (1999–2000 and 2010–11) and village-level household enterprise data, this chapter examines the employment and livelihood potential of RNFIEs in Uttar Pradesh. Though a higher percentage of informal enterprises have reported expansion, still more than half of enterprises are stagnant. These enterprises are essentially owned by illiterate, landless and middle castes having nothing else to do. Almost three-fourths of OAEs and more than half of establishments have GVA per worker below notional income which is a matter of major policy concern. Nevertheless, this study confirms that enterprise profit contributes significantly in household income and in the absence of this, household takes recourse to wage income, suggesting that RNFIEs are replacing casual work in households with enterprises. This study also questions aggregative method of studying RNFIEs.